When you drink Daryl’s iconic Dry Creek Zin you’ll be overwhelmed with dark, juicy deliciousness and understand exactly why this guy’s your 8-time winemaker of the year! Classic Dry Creek Zin from 4 premium vineyards that grow amazing high-quality Zinfandel that sells for $40, easy! Don’t be fooled into thinking Daryl’s Zin is only for fancy occasions. This intense juice-bomb goes INSANELY well with a spicy, pepperoni loaded pizza, as well as sticky, slow-cooked ribs – no cutlery necessary. This distinguished Aussie Durif - aka Petite Sirah, will wrap you up in a rich, velvety blanket of dark, complex fruit. With Angels’ help, Jen got her pick of premium Rutherglen grapes from two super-low-yield vineyards – so every grape that went into this spectacular red is fully saturated with killer flavor. The BIG bold flavors of Jen’s Diamond Durif are perfect with a whole shoulder of lamb that’s been massaged with garlic, fresh rosemary and olive oil, then slow-cooked until fork tender. Hello, showstopper. This barrel-aged Syrah explodes with vibrant, extravagant flavors – blackberries, velvety cherries... mmm. If you're looking for a luxurious red with oomph, you've found it. You gave Derek first access to one of Healdsburg’s most prestigious Syrah vineyards, planted by the Unti family in Dry Creek Valley. This is one fine wine – and it's exclusive to you. This is an Angel-favorite Syrah from a world-class vineyard. Last year, it sold out in less than a month. History is bound to repeat – so grab a few while you can! This Grenache floods your mouth with intense, juicy, red berry flavors, then its alluring subtle smokiness pulls you in for more. Franck used fruit from the cool climate of Montsant which neighbors one of the most expensive wine regions in Spain – so you get all the rich, complex juiciness, without the nose-bleed prices. Tuck into this sassy, juice-bomb with a plate of wafer-thin Iberico ham and a small dish of almonds. It’s a Mediterranean combo guaranteed to make you weak at the knees. Stephen’s smooth, top-shelf Cab is loaded with seductive dark fruits, a touch of spice and velvety soft textures. There’s a reason Stephen’s your most popular winemaker – he knows how to pick ‘em...literally. Harvesting premium grapes from the woodsy Sierra Foothills and sun-filled Lodi, he then aged your Cab in oak for supple textures and flavor. Sip this Cab alongside some ribs dripping in BBQ sauce, a pasta salad and some fresh greens for full-on relaxation. Stefano's Italian blend is part of a new generation of wines from Tuscany - he took a traditionally big red and turned it silky. This is SO easy to drink. On top of world-class Sangiovese from Tuscany's rolling hills, Stefano blended in Cabernet and Merlot from the coast to give this wine more wow-factor (a trick he also uses when making hundred dollar Super Tuscans). You can say a lot of wine is good with pizza – but Toscana is destined for a fresh-from-the-oven slice topped with crumbled sausage, olives and gooey mozzarella cheese. Sip, chomp, sip, repeat. It's most luxurious Friday night you'll ever have. Alive and kicking with flavor with juicy flavors like blackberries, juicy raspberries and cherries, this silky Syrah got a premium touch aging in American and French oak barrels. 20 years of winemaking experience went into this Angel-exclusive bottle! And it's a single-vineyard wine to boot, harvested from the valley of Curico – one of the cooler-climate appellations of Chile. Irene is a Chilean icon - one of the leading female winemakers of her generation! 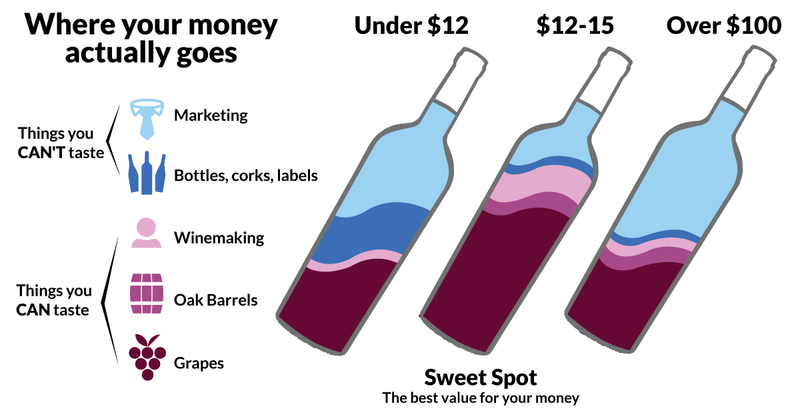 You're getting her best wines for $16 and under because, after decades in the biz, she can make the wines she truly loves. Harvested from 30, 50 - even 100-year-old vines - grown in the heart of Calaveras County. You don't find a lot of these Zins around! Stephen says: "This wine has really good color and body, and a nice Calaveras perfume that the old-vines contribute. I think this is the best Calaveras Zin I've made so far Naked Wines." Dig a knife into some creamy aged cheese - slather a chunk on top of a warm slice of French bread, and have plenty of this flavor-packed red nearby. Bliss. Stephen blended hand-harvested Old Vine Zinfandel grapes for your decadent red. These old vines - some 80+ years old! - grow fewer grapes but have more developed, concentrated flavor. "My goal was to make a very rich, full-bodied Zinfandel with oak nuance, and Angels let me do exactly that," Stephen says. Wines like this one usually sell for a minimum of $35 and up! This small-lot Zin is packed with character. "I love this with braised short ribs and buttermilk mashed potatoes," says your winemaker. "Perfect for chilly weather." ...Irene can introduce this intense red to the world! "Very few Petit Verdots are bottled as single-variety reds," she says. "This was an opportunity of a lifetime. Now it's yours to taste!" An underground red like this is a conversation starter. You'll want a few bottles on hand! But hurry – under 600 cases made.